VARIETY, Lack Of, Tuesday (N! News) — Steven Soderbergh’s new musical version of Cleopatra proves an incredible box-office same-old same-old. Starring Catherine Zeta-Jones as the fishnet-clad vaudeville jazz empress and Hugh Jackman as the mutant self-healing Roman general — in 3-D! —the film carries the Ocean’s Eleven franchise somewhere beyond its ultimate extent. In a 3-D musical tour-de-force, Caesar (Patrick Stewart) dies at the Senate at the hands of Brutus (Popeye) (“We Both Reached For The Gun”), Cleopatra fakes her death to get Antony to like her (“Razzle Dazzle”), Antony fakes faking his death to get over Cleopatra and dies in her arms (“I Can’t Do It Alone” — with zither solo on Jackman’s adamantium claws) and Cleopatra dies of an aspidistra (“I Move On”). All die. Oh! the embarrassment. This ending having been rejected by test audiences, a finale is tacked on with one thousand Agent Smiths engaging in CGI sword-fu — in 3-D! — while Brad Pitt gets out of the casino with his haul intact. 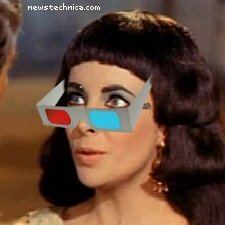 Since this makes no sense even to the drooling lackwits they manage to find for test audiences, Cleopatra starts a new 3-D vaudeville jazz act with Octavia which is vastly successful (“And All That Jazz”). A happy ending! Soderbergh pooh-poohed suggestions that the film would be some sort of low-rent exploitation quickie that would insult the intelligence of any creature smarter than a flatworm. “I can assure you this will be the most artistically satisfying creation in my entire career as a director,” he said, lighting a cigar off a hundred-dollar bill before laying back on a great big bed made of money.